We Can’t Wait to Connect with You: MyStarbucksIdea.com (Open thread). I get emails now and then suggesting new article topics on this site. Recently, a reader wrote me asking to write an updated article about MyStarbucksIdea.com. Now you know its very beginnings. I believe that idea for MyStarbucksIdea.com came from Dell computer’s IdeaStorm.com website. 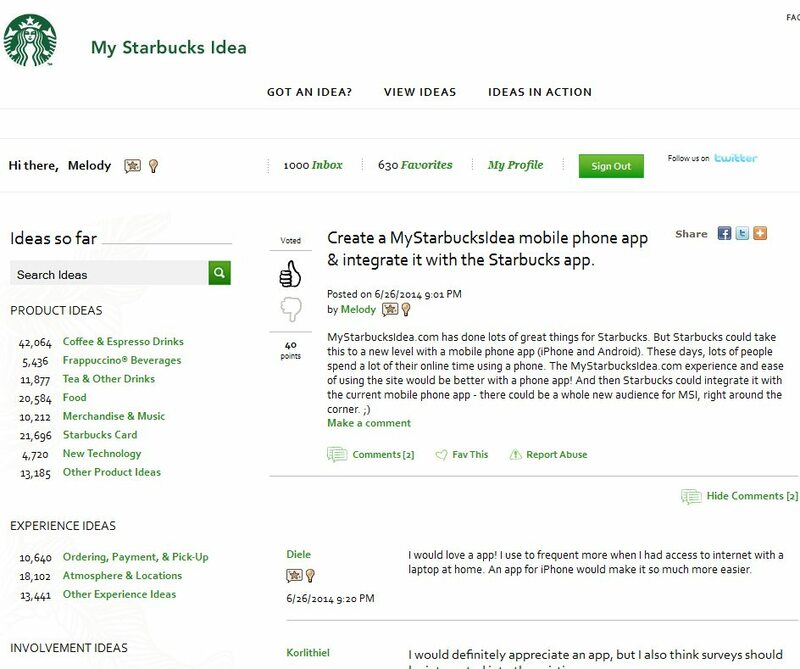 Create a MyStarbucksIdea mobile phone app & integrate it with the Starbucks app. Sacramento Starbucks Gift Card – The Californian deep inside of me was a little persuaded by this idea. Please bring back the apple fritter – I was never a huge fan of donuts, generally speaking. Nonetheless, I get that the apple fritter had its own special kind of following! Reading Rainbow Kickstarter Program – This is an idea that essentially wants people to donate to the Reading Rainbow Kickstarter fund raising. 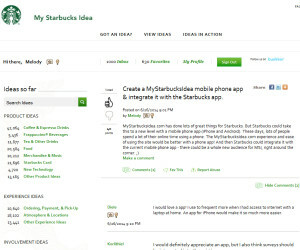 Feel free to weigh in about MyStarbucksIdea.com – Have you ever created an idea or voted there? What do you like or don’t like about MyStarbucksIdea.com? Do you think that it’s promoted enough by Starbucks? Do store partners know about it? It represents an enormous opportunity for Starbucks to hear feedback about their brand. I’ve analogized MSI to a weather vane before – it will always tell you which way the storm is blowing, but you’ll lack any fine science about that storm. I also recently had a request for an open thread. Feel free to weigh in on any Starbucks-related idea. Westlake Starbucks: Looking back 14 years ago at opening day. 2 new Starbucks Reserve Coffees: Maui Mokka and Malawi Peaberry Sable Farm. For most partners, working on Christmas Day was just like any other day. More than anything I would really like an Ignore feature, so that I can choose not to see comments from certain individuals. This would really increase my enjoyment of the site. @Carol – I hear your. There’s one user whose every comment seems to be just to ask a question about the idea, without really thinking through the actual idea. Once in a while that works, but all the time, that sounds tiresome. (To be clear, I think he’s trying to write good comments. I’m assuming positive intent here, but his style is answer every idea with a question). I’d like the feature to be able to report an idea more than one time. Once you click “report post” you can’t report that same idea again. As it is, it’s often impossible to describe why you’re reporting it within 100 characters. But it’s not unheard of for the same idea to have a second flare up – and then there no way to report the post again. Each comment should have a report comment icon, not just one report post for the whole idea. Surely, that could be programmed into it. I know exactly who you are talking about Melody and yes, beyond tiresome! At first I thought you were talking about me Melody, but then I realized I don’t usually ask questions 🙂 Reporting is of no use, none. I even think they’ve stopped listening to the reports on SirMark. He’s had this current ID for quite a while now. That board is a mess. Melody I have virtually stopped going to MSI for some of the reasons already noted. I used to find the site of value but not so much anymore. I am in MA now and at the SB here it was the first time I struggled with wifi. Very annoying. Also, interesting that the partner said they sell a lot of iced green tea that they have it in a urn opposed to the pitcher. Wow, I just looked at Dell’s website. If that was what MSI was shooting for, they missed the mark considerably! I shouldn’t be surprised, technology isn’t SBux’s strong suit. You know what Dell has though? Moderators. That seem to respond to every idea in an attempt to flesh them out. I’d bet they kill trolls and merge/delete repeat ideas too. Take note SBux, that’s how it’s done. I only recently started going to MSI. Honestly I seen it before but never clicked it. It’s actually a great idea to have. Voice your opinion give and idea. And now as a partner we have our own site as well. However I think it needs to be more closely moderated and have mods update more frequently. It almost comes across as not listening. And that goes on either site. Just my opinion though. @SnowWhite – The other thing that happens at MSI is that when a thread is moderator, the offending comment posts are removed. Sounds great in theory – though it can leave a thread’s comments with all the continuity of a book with pages ripped out. Also means that some of the worst offenders come off looking squeaky clean in their comment histories – they’ve literally been cleaned up. @Nicholas – I think it is a great idea to have the site – there’s no doubt Starbucks hears what customers are really thinking. Even if you don’t like what you hear, that feedback is valuable. A complaint is much more valuable the customer who silently walks away without saying anything at all, never to return. Even if someone harshly says, “My Starbucks is too slow and the baristas aren’t friendly” – That’s a complaint – yet valuable to hear. And yes, the lack of moderation can make it seem like they’re not listening. Thank you for your comment! Starbucks has blown it with MSI. They had a chance to create a social network that would be a shining star of the Internet. Instead, because of lack of moderation and poor programming of the site is just another broken down park bench in the not so good part of town. MSI has missed the opportunity to educate and really keep people informed. I signed on to MSI on its very first day. I had high hopes for it and I am sure Starbucks did/does too. But they have failed to realize or learn. The same can be said for their Facebook and Twitter sites. Cecile used to regularly communicate with me, but I have heard nothing from her (or any other Mod) in over a year. So maybe she is saying that us old timers who try our best to inform and stimulate discussion are no longer welcome, while allowing the antagonist with a new ID every month to continue to bring out the worst in me and others. Forgive me for that folks, I may be an ol’ fart, but I am still a work in progress. @SnowWhite, I am glad you looked at Dell’s site. They are doing it right. I hope more folks take a look at it as an example of what could have been. Unfortunately it is nigh near impossible to restore a website to quality and credibility, so unless Starbucks is ready to invest some serious resources in MSI they had better drop it and then realign resources to get rid of the third-party customer service and bring it back in-house. The tenor of this conversation is that MSI could stand to have more moderation (among other things). My own experience is that Starbucks believes that the moderation (or the lack of) is fine. It’s like as those who give feedback on the moderation are dismissed. Again, most people don’t like to hear what doesn’t sound good to their ears. But yes, it’s amazing that one person gets to return over and over under a new identity each month – it actually makes it so that there’s no accountability for what he posts. He gets to start fresh once or twice a month, rather than creating any track record of comments. Hi Meloday, I just discovered your blog & love it. Today’s post is timely as just a couple weeks ago I had an idea, so I just went to the site & posted it! @Stina D – I saw your idea and considered it thumbs up worthy. Do not be discouraged if the vote count goes the wrong way, there are way too many multi-ID folks that do nothing all day than sit and vote down everything. I hope you get some positive comments. Your idea could be highly instructive to, I’m sure, the majority of Starbucks customers that do not appreciate the innovation and variety of some Starbucks stores. I think the MSI is a bit of a jumbled mess. My main idea was to bring back almond syrup. I submitted that years ago and there were duplicate ideas with the same name now and probably just as more then. It is hard to vote on one in order for it to get popular. If they would just combine the almond syrup idea into one official idea post, then more people could vote. Better visibility. Melody, I think the idea storm website has a number of nice ideas but it seems very cluttered to me. I would rather Starbucks take a note from Amazon and treat it more like forums, since it would allow for more discussion and for repeat ideas to be dragged from the depths rather than often repeated. Regardless, updates to the website would be nice. Brian, now that would be interesting. Have moderators on occasion combine ideas into a single thread, something I’ve read about happening on the Amazon Kindle forums (which makes a mess for someone who hasn’t followed either thread to read). As Usual for me, DadC….summed it up perfectly! I, too, went to MSI back in 2008 with great expectations. I don’t visit it nearly as often as I used to, but I do keep checking in and post an occasional comment or idea. Speaking of Cecile, oddly I just communicated with her over the past 2 days. I’ve been having trouble posting a comment on the ‘ideas’ side…I write it all out, hit ‘post’ and it just disappears. Happens to me about 75% of the time lately. But I agree, I used to have much more direct communication with her in the past. And of course, we do need more, much more, moderating! Back when I joined initially, it was about the stinkin’ PPR 🙁 and wanting “boldallday”. (not much has changed regarding that issue since then! sadly) The one good thing was: it did bring this community of some of us together…and here we still are! I came across a post on the Serious Eats Blog that explains how to do a pour over coffee in more detail than I can ever recall seeing. Hope you find it as interesting as I did. As usual….. I’m agreeing with DadCooks and Denise. I’m not one of those who have been there since day one, but it’s just not a nice place to go too any longer. Respectfully I no longer agree that it is a good tool. It reminds me of a Government program that has good intention to help, but gets corrupted by those who use the program for some personal benefit, while Government allows it to be corrupted just so people running the program can claim to have a job. Its a lost cause on Starbucks end and on our end. As it exists today, it should permanently implode and go away. They need something new! Let us be honest with ourselves….. 10 – 20 people pretending to be many more is of no value to anybody. @DadCooks – If it wasn’t for old farts like yourself to step up and add something to msi of some value, who would do it? It’s sad when one has to moderate a website that belongs to somebody else. I have basically given up on msi. My opinion is to just keep those Reserves coming out, and give me my coffee. I don’t care to share my opinion there any longer. Speaking of Reserves….. Is it true that another crop of Yirgacheffe is coming out in the weeks or days ahead? @Chgo – thanks for the compliment. The MSI moderators must be on vacation and even sbx_bean has only made one or two comments in the past month. How can a company consider itself world class and allow its social media to be an example of how it is not done. If I had any Starbucks Stock left I would sell it. As is my Starbucks use is down over 60% from last year. I’ll be interested too in knowing about the Yirgacheffe. @DadCooks – It appears they have retired – IMHO! and yes, I was told yesterday at the Clover Mt P. store on NW Hwy, we should see another round of Yergacheffe later this month! Yay! I hope you got to have some of the Maui Mokka? Had it by Clover yesterday (new batch just in) and it was THE best coffee I’ve ever tasted, at least a huge tie with my beloved Yergacheffe. REALLY outstanding, to me. Really really SO perfect. @DeniseR – I’m looking forward to another round of Yirgacheffe. And that Maui Mokka is so amazing – it doesn’t taste like what you might guess a coffee from Hawaii would taste like. One of the best Reserves ever. @Denise – Now we trade snow and ski’s for torrential downpours and canoes. Has anything changed but the temperature? Yes I have had the Maui Mokka. I think it was better than last years. Unfortunately, the caffeine is affecting me again, so I have been cutting down on my visits, because there is a 75% chance I’m ordering a Reserve with caffeine. I’m not happy about that. Last week I avoided Starbucks all week except the weekend. I wasn’t a happy camper, but I can’t complain considering DadCooks isn’t near a Clover at all. The Peru is out, which I think is also better than last years. Yirgacheffe is coming, and more Maui Mokka ( I have been told – IDK) and another Reserve is coming out with the Yirgacheffe. @Chgo: sorry you’re missing out on so much coffee:( Am drinking the Maui Mokka that I brewed right now. Really loving it, and looking forward to the next round of Yergacheffe! @Denise – Today is a Holiday, so I’m having caffeine! Possibly a Maui Mokka. ; ) I wish they would have released the 2nd Brazil Reserve (Fazenda Apucarana) into stores. I would have liked to have tried that one. The Bourbon Rio Verde sold out rather quickly, which I really liked. @To all! A very nice – safe (3 day) 4th of July weekend! Melody did I miss something? What were the results of the Rafflecopter giveaway? Melody, thank you for the article! I want to bring international perspective to this discussion. Outside the US, I know only two persons who heard about MSI. I was so surprised! I talked with my partners-friends at Starbucks in Europe – they did not even know about such a site. In my opinion, it is a big mistake from Starbucks management. There are so many Starbucks fans with interesting ideas outside the US…and they simply do not know anything about MSI. If Starbucks could promote the website somehow, they would get more people and ideas. More people and ideas, in turn, could bring life to this website.